If you have multiple criteria to be set for fetching data from database , Hibernate provide a feature called query by example. Here you can create an example object with all the properties set to it . This object can be passed to Example.create() method. Lets try to understand querybyExample with the below example code. Here in this example lets pull the record from Employee table with column value for emp_name as “Alex” . It is possible to exclude properties also as below. We can have as many exclude property as we need. Query by Example is useful if you have lot of properties to set for your query. Query by Example is not applicable for Primary key column, So if you give primary key column for QueryByExample it is going to return all the records. Query by Example is not applicable for column with null value. In this article we are going to see how to call a stored procedure from hibernate using NamedNativeQuery . Consider we have a stored procedure GetEmployee created in MySQL , which accepts one input parameter and return the row. Now lets see how to call this Stored procedure, using NamedNativeQuery. Using the below class , we can call the stored procedure. 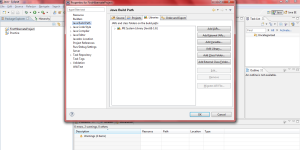 Hibernate session provides two methods – get and load to access the objects. Both are doing same kind of functionality , But there are some differences. Lets try to understand those differences with example . load() method : This returns a proxy object by default and there won’t be any database hit until we invoke it. Hibernate: select employee0_.emp_id as emp1_0_0_, employee0_.emp_name as emp2_0_0_ from employee employee0_ where employee0_.emp_id=? Here you can notice the DB hit happened only after we invoked the object with emp.getEmp_name(). Here you can notice that the DB hit happened immediately. 2) load () method will throw exception if there is no record in the DB with given unique ID , But get will return null . We have an employee table and it has only one record , emp_id is 1 . Now lets try fetching the object with unique emp_id 10 which is not available. If you are not sure that the object exists , use get method. If you are sure that the object exist, you can use load method to access the objet. get method will return a completely initialized object which may involve multiple DB hits based upon object relational mapping. 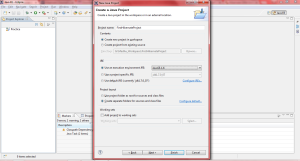 load() method returns a proxy which can be initialized on demand. In this article we are going to see one of the important criteria API feature called Projection. There are lot of things you can do with Projection . Here let’s see some of the important usages of projection. Projection can be used to perform aggregations like count,max etc., The below example shows how to use projection for getting the count of employees. Projection to fetch a particular Property. We can get a particular column values by adding projection to a criteria. The below example shows how to get only emp_name field from Employee table using Projection. We can add any number of projects to a criteria, In the below example we are going to fetch two columns emp_name and emp_id. Hibernate framework provides the concept of named native queries to put your native SQL into the XML mapping file or via annotation. Developers like to put SQL string literals scatter all over the Java code. Hence it is very hard to maintain the code and also the code looks ugly. This can be avoid using named native query concept. The hibernate namedNative query is a way to use any query with meaningful name. @NamedNativeQueries: This annotation is used to define the multiple named native queries. @NamedNativeQuery : This annotation is used to define the single named native query. You have to declare the ‘resultClass’ to let Hibernate know what is the return type, If you fail to add this , You will get an exception “org.hibernate.cfg.NotYetImplementedException: Pure native scalar queries are not yet supported“. Hibernate framework provides the concept of named queries to put your HQL into the XML mapping file or via annotation. Developers like to put HQL string literals scatter all over the Java code. Hence it is very hard to maintain the code and also the code looks ugly. This can be avoided using named query concept. The hibernate named query is a way to use any query with some meaningful name. query = "from Employee e where e.emp_name = :name"
@NameQueries : This annotation is used to define the multiple named queries. @NameQuery : This annotation is used to define the single named query. Compiled and validated at the time of application startup. Easier to maintain than string literals embedded in the code. We can avoid duplicate code. Native queries cannot be customized at run time. In this article let’s see how to setup development environment to use hibernate framework with eclipse. 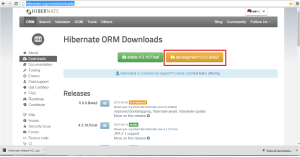 You can find hibernate-core-5.0.0.Beta2 which is main jar file that is required to use hibernate library. Right click on project select properties. 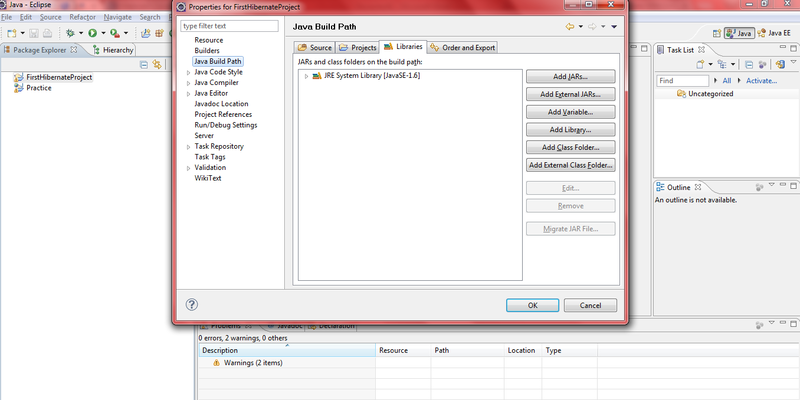 Within properties go to Java build path and select libraries tab. 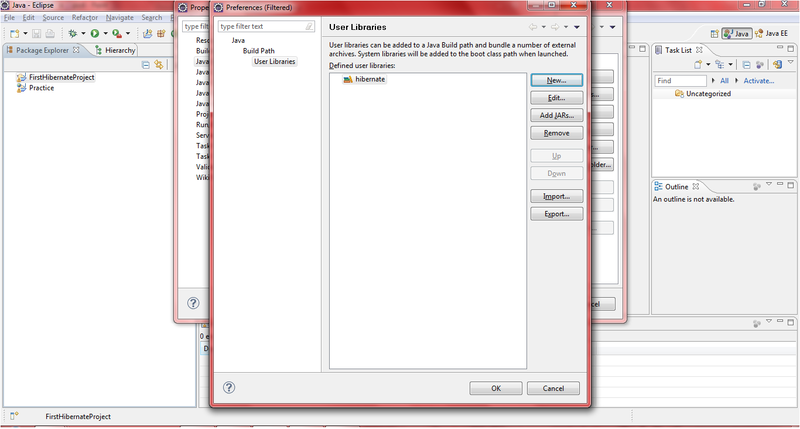 Click on Add Library tab and select user library. 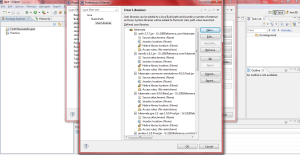 Click on new and specify library name and click Ok. 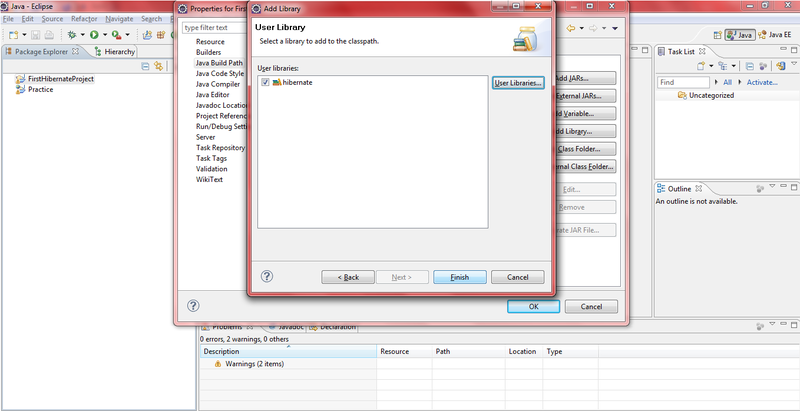 I have created library with name hibernate (Refer below picture). After creating library, the next step is to add jar files. Click on “Add JARs”. 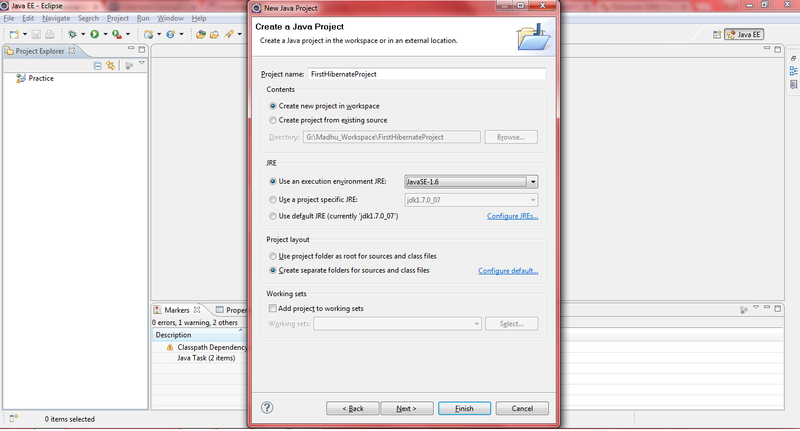 Select main jar file, required and JPA jar files from extracted files. Click on ok.
Now you can see that hibernate library is added to your project with all the required jars. You must have database installed in your machine. So that, we can configure hibernate to connect to database. You can have any database available and configure hibernate to connect to database. Hibernate internally uses JDBC driver to connect to database. So depending on database, you have to provide hibernate the JDBC driver, So that it can use that driver to connect to database. Add your JDBC jar file to a project (Got o properties->Java build path-> libraries-> Add external jars): This will help hibernate to connect to database that you have installed in your machine. Install database in your machine. Provide JDBC for that database to hibernate. This is all the ground work required to configure project that uses hibernate. We created project, added hibernate jars and JDBC for the database. Now you are all set to write code that uses hibernate. 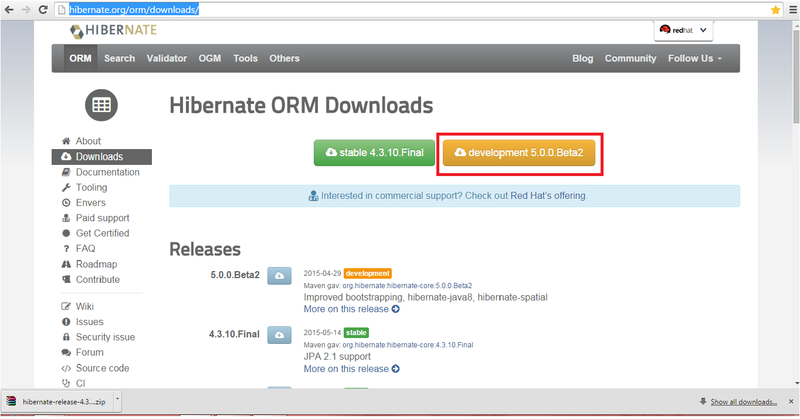 Hibernate has started as ORM(Object Relational Mapping) tool. Now lets understand what is the problem that hibernate is going to solve or what are the benefits of using hibernate with an example . Let’s take an example of inserting Employee data in a table. Consider we have 5 records to be inserted into the table from the employee object list. 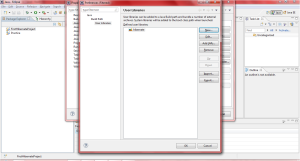 We need to do the following steps for inserting the Employee details into the table. Step 4: Execute the query. Here also we are doing the mapping manually..
To insert employee object into database we need to manually map every member variable to column. If we add new column in database or new field in class, we need to make changes in code to map this new field to column and if you are retrieving data you have to set values for these new fields. Let’s say an employee object has a reference to a address object. Now I have to map employee to employee table and address to address table and if dependency exist between these two I have to handle that by creating Foreign Key and Primary Key and mapping Foreign Key of employee to Primary Key of address table. This relationship has to be taken care of. 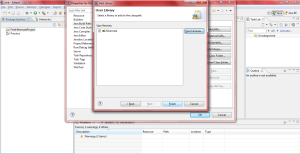 Lets say you retrieve one employee object from database and set it to employee object in java. If we have changed phNo of employee, the state of object has changed. To update this changes on database, I have to write update sequel query and set values depending on the values that have changed. updating object state on database have to be handeled manually. Lets say I want keep track of whether an employee is a good performer or not. In java we simply make use of Boolean variable and set to either true or false. But there is no Boolean variable at db level so we can use either char(Y/N) or int(1/0) to indicate performance. So we need to handle this data type conversion while inserting employee object into database and while retrieving and setting it to object. Hibernate came into picture to reduce this gap between Relational database and object and it helps relational to object mapping . 1) As Hibernate is set of Objects it helps you to avoid SQL, you don’t need to learn SQL language.You can treat TABLE as an Object . 2) Powerful object-oriented hibernate query language . 4) Descriptive O/R Mapping through mapping file. 6) Hibernatre is database independent,It is not specific for a particular data base. The same code will work for all data bases like ORACLE,SQLServer,MySQL etc. If you to change the database all you need to do is just change the configuration file. 7) Query optimization: If you use Criteria Quires in Hibernate then hibernate take of the query performance. In case of JDBC you need to tune your queries. 8) First level caching and Second level caching which has vital role in the performance. 10) We can make use of User defined data type .In case of DB, only some database offer this feature, but if you migrate to other database it will be difficult. Let’s see how to configure query caching. Here we are adding the following lines to use query caching. We have to tell hibernate that a particular query result has to be set in the cache for future use. We can do this configuration as below . WARNING: Could not find configuration [org.hibernate.cache.StandardQueryCache]; using defaults. Here you can notice that hibernate has hit the DB only once . The second result is fetching from the cache. setCacheable method is performing two roles. Now lets see how the QueryCache is working with the below code . I have explained the first level caching in my previous article ( First level caching using hibernate ) . Now lets see how hibernate provide the second level caching. We know that first level/Default caching is implemented on session. That means if we close the session object and fetching the same record using different session,Hibernate will hit the DB again . Hibernate provides an option to set the second level caching also through which hibernate make use of cache across the sessions. Now lets see how can we configure the second level caching . We have to change this provider class to one of the class which hibernate is supporting . Here we will take an example to set it as Ehcache. 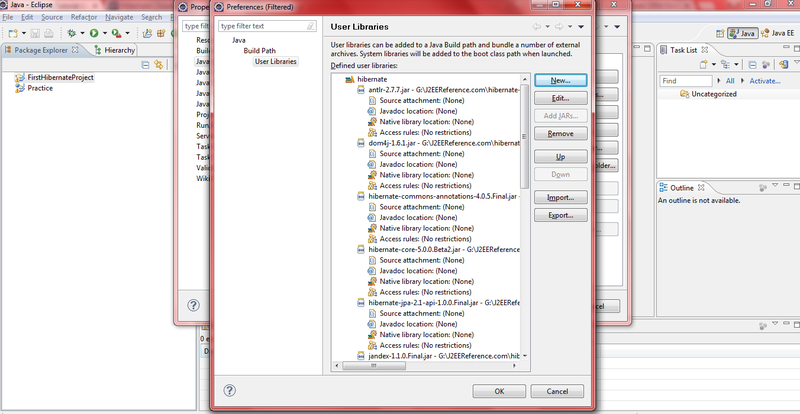 Two lines mentioned below are required to set the second level cache. In order to use Ehcache we have to download ehcahe.jar file . There are different values for the usage attribute . Here we are using the Employee entity only to read records. So i am setting as READ_ONLY. INFO: Hibernate Validator not found: ignoring Oct 15, 2012 7:29:51 AM org.hibernate.tool.hbm2ddl.TableMetadata INFO: table found: invoicetracker.employee Oct 15, 2012 7:29:51 AM org.hibernate.tool.hbm2ddl.TableMetadata INFO: columns: [emp_name, emp_id] Hibernate: select employee0_.emp_id as emp1_0_0_, employee0_.emp_name as emp2_0_0_ from employee employee0_ where employee0_.emp_id=? Here you can notice that hibernate generated only one query to get the data using two separate session objects. If we are not configuring the second level caching hibernate will hit the DB again.